Also know as Golden Peak for its golden wall facing Hunza from the south, Spantik is the most attainable 7000m peak in the Karakoram. The dramatic approach trek along the Chogolungma Glacier passes through a variety of beautiful mountain surroundings far from the regular trekking routes. Straightforward climbing leads to the summit of the mountain where clear weather conditions result in tremendous views in all directions. There are two prominent ridges; South East and North West. 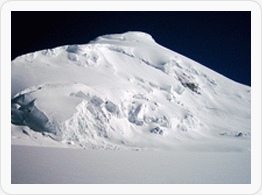 South East is a long and demanding snow ridge with few sections of technical difficulty and little objective danger. This route was climbed on July 5, 1955 by a party led by K. Kramer. The North West (Golden Pillar) is massive combination of ice and rock. The first successful summiteers on this route are British climbers Mick Fowler and Victor Saunders. Spantik is a truly Himalayan scale objective: an ideal next step for those who have previously climbed a 6000m trekking peak, or for those preparing for an 8000m expedition. We can run this expedition on demand for small groups. Contact us to discuss your requirements.